This article by Gale Boyd originally appeared on the MormonHub website on March 26, 2017. After the martyrdom of Joseph Smith, the apostles gathered in to Nauvoo from their missions. 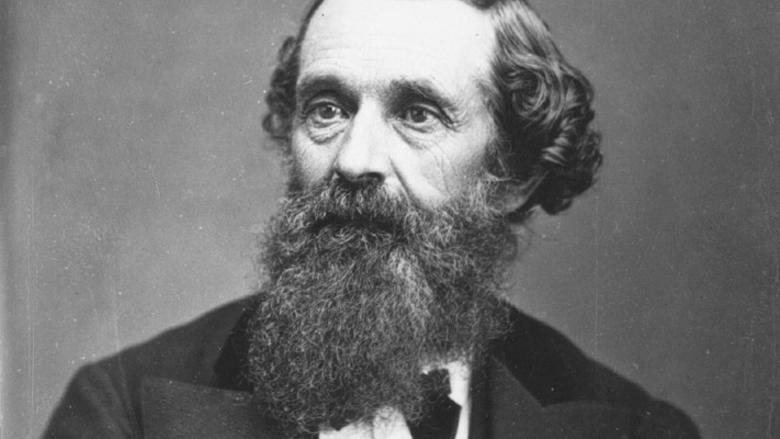 Sidney Rigdon, estranged from the Church, now wanted to be its “guardian.” He called a conference for a certain date, but it was scheduled by Elder Marks a bit later, for Thursday, August 8, 1844, after Brigham Young and other apostles finally arrived in Nauvoo. The meeting’s purpose was to sustain a new leader of the Church. Rigdon had met with the apostles, who were united quickly. The apostles firmly felt they held all the keys of the kingdom. A solemn assembly was called for later that day. On that day a miracle occurred before the body of the Church—Brigham Young was transfigured before the people, and the succession crisis of the Church was resolved…. Sidney Rigdon spoke for an hour and a half about his desires to be the guardian of the Church, but he awakened no emotion and said nothing that marked him as the true leader. 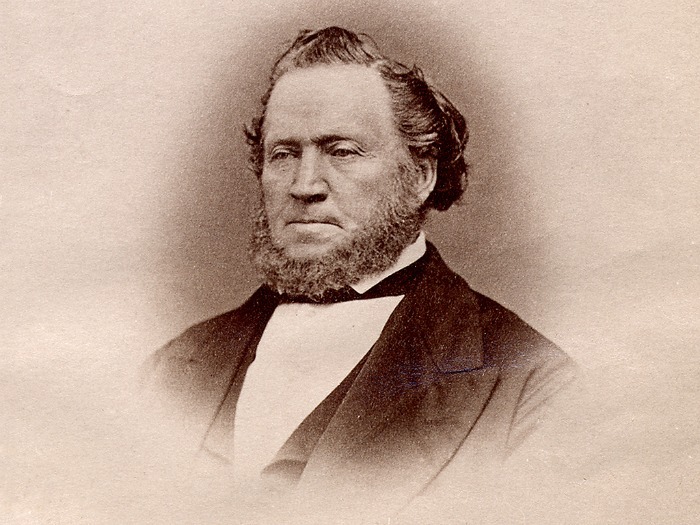 Brigham Young told the audience that he would rather have spent a month mourning the dead Prophet than so quickly attend to the business of appointing a new shepherd. While he was speaking, he was miraculously transfigured before the people. This miracle brought the Saints in unison under the leadership of Brigham Young. Read more in Church History in the Fulness of Times. 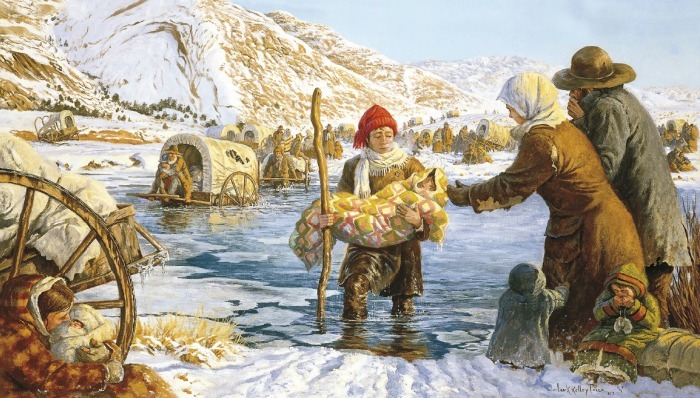 “As the Saints prepared for general conference in Salt Lake City in October 1856, everyone assumed that the arrival of the third handcart company ended the immigration that year. But Franklin D. Richards, who had come into the valley two days prior to the conference, announced that two more handcart companies and two ox-cart supply trains were still on the plains and desperately needed food and clothing to finish the journey. The response was impressive. Sixteen wagon loads of food and supplies were quickly assembled; and on the morning of 7 October, sixteen good four-mule teams and twenty-seven hardy young men (known as Brigham Young’s “Minute Men”) headed eastward with the first provisions. More help was solicited and obtained from all parts of the territory. By the end of October, two hundred and fifty teams were on the road to give relief” (Church History in the Fulness of Times). Thomas B. Marsh had once been President of the Twelve but lost his testimony, rebelled against the Church, and left. 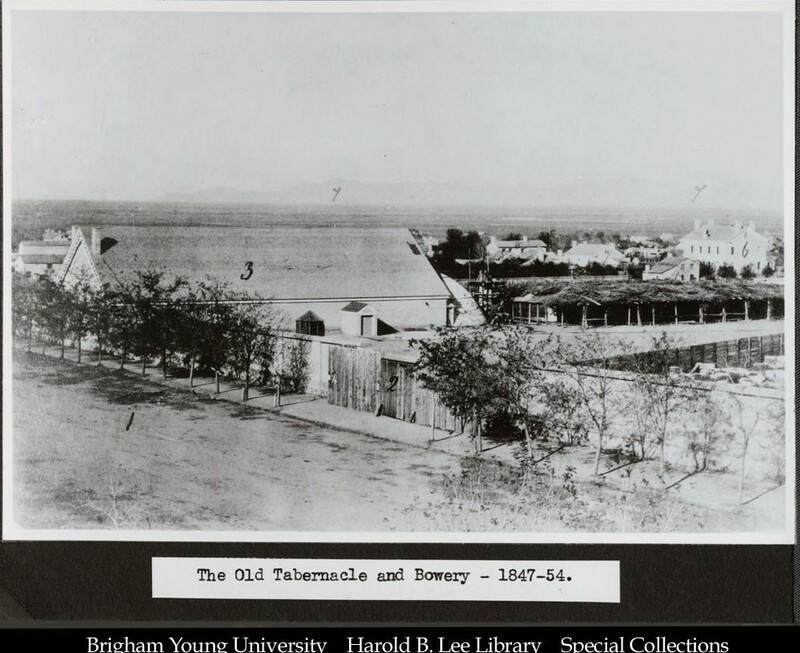 Penitent, he made his way to Salt Lake City and was invited by Prophet Brigham Young to speak to the membership of the Church in the Bowery in Salt Lake on Sunday, September 6, 1857. I have sought diligently to know the Spirit of Christ since I turned my face Zionward, and I believe I have obtained it. I have freTquently wanted to know how my apostacy began, and I have come to the conclusion that I must have lost the Spirit of the Lord out of my heart. Well, this is about the amount of my hypocrisy–I meddled with that which was not my business. But let me tell you, my brethren and friends, if you do not want to suffer in body and mind, as I have done,–if there are any of you that have the seeds of apostacy in you, do not let them make their appearance, but nip that spirit in the bud; for it is misery and affliction in this world, and destruction in the world to come (BYU.edu). Under the Edmunds-Tucker Acts, the U.S. government hoped to end polygamy. The Edmunds-Tucker Act of 1887 also included provisions aimed at destroying the Church as a political and economic entity. The law officially dissolved The Church of Jesus Christ of Latter-day Saints as a legal corporation and required the Church to forfeit to the government all property in excess of fifty thousand dollars. Many of its leaders, husbands, and fathers were imprisoned. Wives were forced to testify against their husbands, voting rights were curtailed, and life became very difficult for the Saints. Wilford Woodruff was 80 when he began to lead the Church. Although arrests and imprisonments caused families to suffer, the greatest problem for the Church was its inability to acquire and hold the funds necessary to build temples, do missionary work, publish material, and provide for the welfare of the Saints. It was the end of August when President Woodruff received confirmation that the U.S. government, in spite of an 1888 agreement promising that temples would not be disturbed, was going to confiscate them. President Woodruff said later that the Lord had shown him by revelation exactly what would take place if plural marriage did not cease. The utter destruction of the Church. 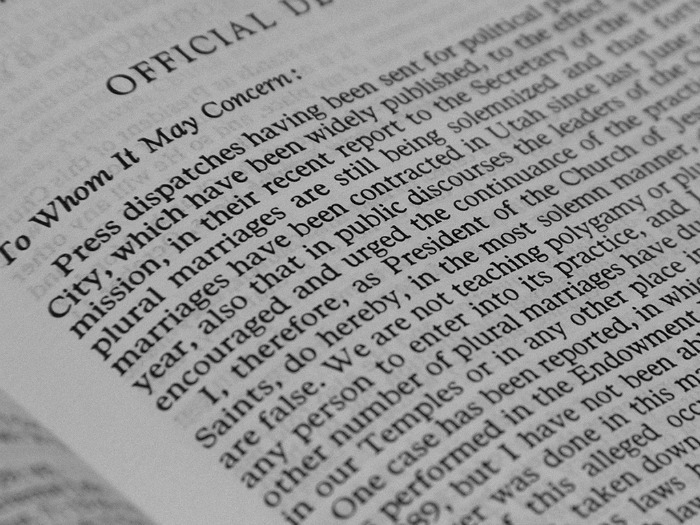 After a great spiritual struggle, Woodruff drafted the Manifesto, now Official Declaration 1 in the Doctrine and Covenants, ending polygamy among the Saints. 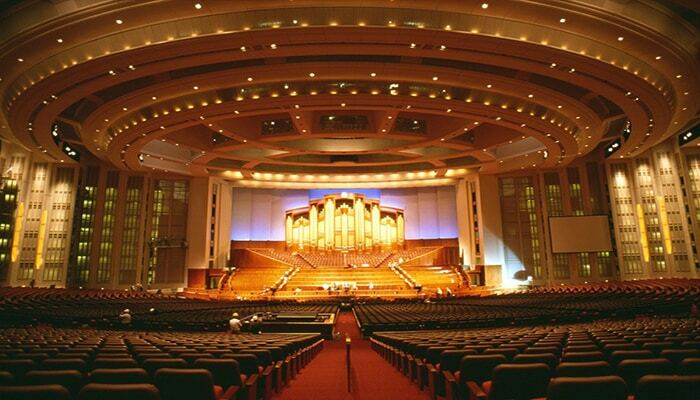 General conference convened Saturday morning, 4 October 1890, and lasted three days. It was on the third day of the conference that President George Q. Cannon announced the Manifesto and then asked Orson F. Whitney, then bishop of the Salt Lake City 18th Ward, to read the document. The Saints in attendance, recognizing the authority of the Prophet and the Brethren, unanimously accepted it (from Church History in the Fulness of Times). Even after Prophet Lorenzo Snow attached the punishment of excommunication for those still practicing polygamy, the Church did not recover financially. The Church went about $300,000 in debt as a direct result of the Edmunds-Tucker Act. It was also taking care of the families of men jailed for plural marriage, as well as their legal fees and court costs and its own legal expenses. Tithing revenues had declined in the 1880s because members had been reluctant to contribute when the federal government was confiscating the money. The Church was forced to borrow money from worldly financial institutions. President Lorenzo Snow prayed long and hard about the situation, desiring to use the Church’s resources for forwarding the Lord’s work, and to bring it to a sound financial situation. Under inspiration, he had set in motion the program that would, by 1907, completely free the Church from debt. Many Saints testified that not only were the windows of heaven opened to save the Church, but those who followed this divine law were spiritually and temporally blessed as well (Church History in the Fulness of Times). Stories always make for the most memorable General Conference talks, and this one by Boyd K. Packer stays with the listener forever. We sometimes think we know the lay of the land and fail to see the dangers around us and fail to heed those who do. Elder Packer gave this talk in April 1976 and aimed it especially toward the youth of the Church. Actually called The Purifying Power of Gethsemane, this moving talk is remembered with affection and gratitude by all who heard it. Bruce R. was dying of cancer at the time. 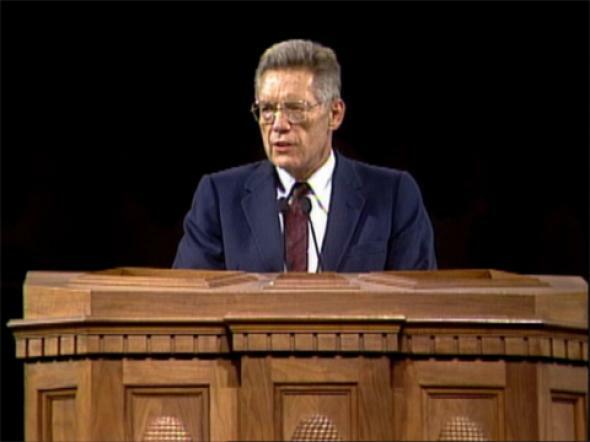 He delivered this talk in April General Conference, 1985, and died a short time later on April 19th. This was his final, emotional testimony. “And now, as pertaining to this perfect atonement, wrought by the shedding of the blood of God—I testify that it took place in Gethsemane and at Golgotha, and as pertaining to Jesus Christ, I testify that he is the Son of the Living God and was crucified for the sins of the world. He is our Lord, our God, and our King. This I know of myself independent of any other person. President Ezra Taft Benson delivered this address in April 1989 General Conference. It is a landmark talk on the evils of pride. “The central feature of pride is enmity—enmity toward God and enmity toward our fellowmen. 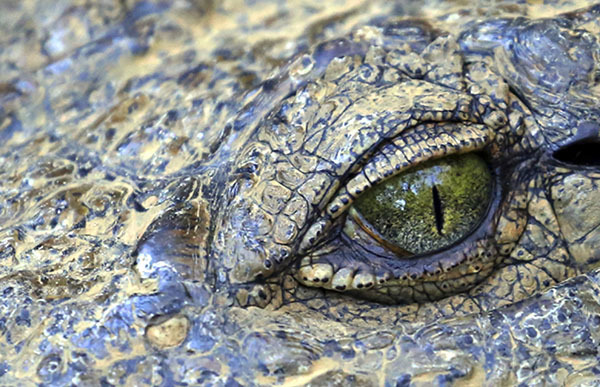 Enmity means “hatred toward, hostility to, or a state of opposition.” It is the power by which Satan wishes to reign over us” (LDS.org – General Conference). Hugh B. Brown delivered this memorable address, called The Profile of a Prophet, at BYU in October 1955. Elder Brown told a story about bearing testimony of the restoration under the Prophet Joseph Smith, supporting his testimony with logic. John, the beloved disciple of Jesus, declared, “The testimony of Jesus is the spirit of prophecy” (Revelation 19:10). If Joseph Smith had the testimony of Jesus, he had the spirit of prophecy. And if he had the spirit of prophecy, he was a prophet. I submit to you, and I submitted to my friend, that as much as any man who ever lived, he had a testimony of Jesus, for, like the apostles of old, he saw Him and heard Him speak. He gave his life for that testimony. I challenge any man to name one who has given more evidence of the divine calling of Jesus Christ than did the Prophet Joseph Smith. 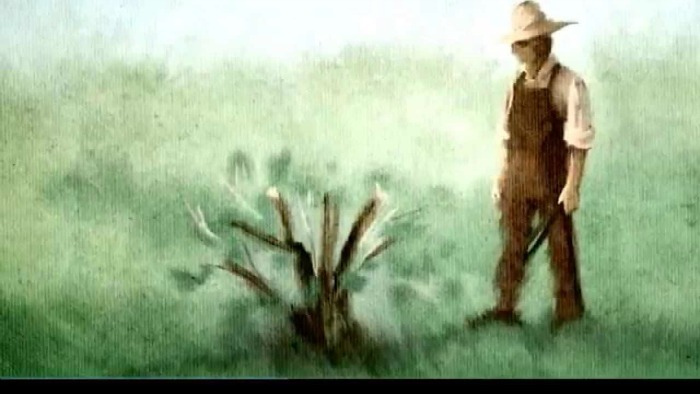 One of the most famous talks ever in the history of the Church is Hugh B. Brown’s God is the Gardener, which includes the Parable of the Currant Bush, delivered in May 1968. It is important not only that you keep growing but that you be versatile, adaptive, and unafraid to venture. In other words, be up to date. Seek to obtain a certain flexibility of mind that will inspire you to listen, to learn, and to adapt as you move forward into a new and ever-expanding universe. What is your favorite talk from the past? Share in the comments below.